Last September, the universe sent me a message. were three little words for me to figure out. 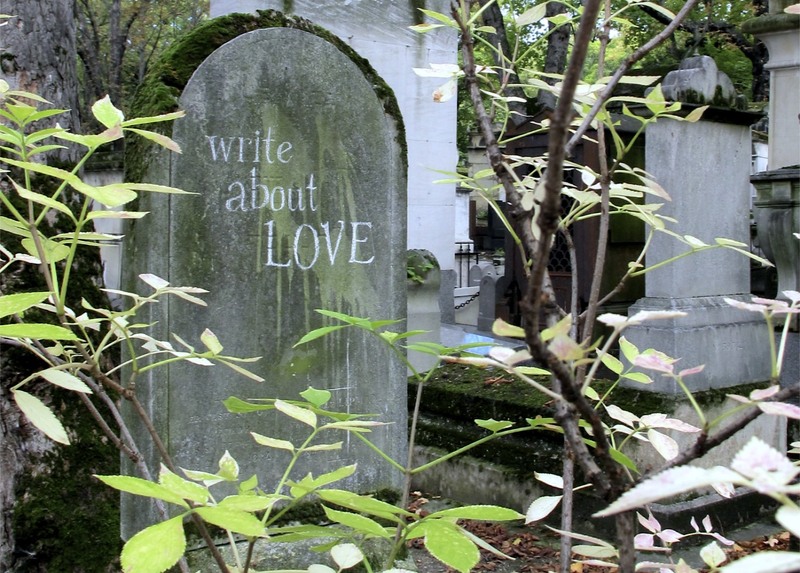 This entry was posted in Big Bag of Dreams, Books, One Word - Completion, Photography, Writing and tagged Elizabeth Harper, Gifts Of The Journey, Paris, Pere Lachaise, The Write About Love Project. Bookmark the permalink. Lovely! (!!) Happy Valentine’s Day! I love your new idea for a blog. Just read a wonderful story over there, “Come To The Edge” and I’ll be visiting again. Last week, I stretched my writing comfort zone and wrote a piece called “The Journey” based on a photo prompt of a brick path. I’d love to have your feedback on it, my fellow writer and creative traveler. What a lovely idea, and the site looks wonderful. Also enjoyed your London pics — awesome as always! I can’t tell you how honored I was to be able to contribute to your launch. When I read your story of how the idea for this project evolved, I got goose bumps. Tomorrow, in my “Workshop Wednesdays,” I will feature your blog and ask my readers to submit entries to you. InJaynesWorld, thank you so much for the compliment. You made my day. what a great idea. i look forward to reading more.